SRCWA "Winter Wonderland Ball" tickets now on sale. - Seniors Recreation Council of WA Inc. Seniors Recreation Council of WA Inc. presents it’s Annual Seniors Ball. 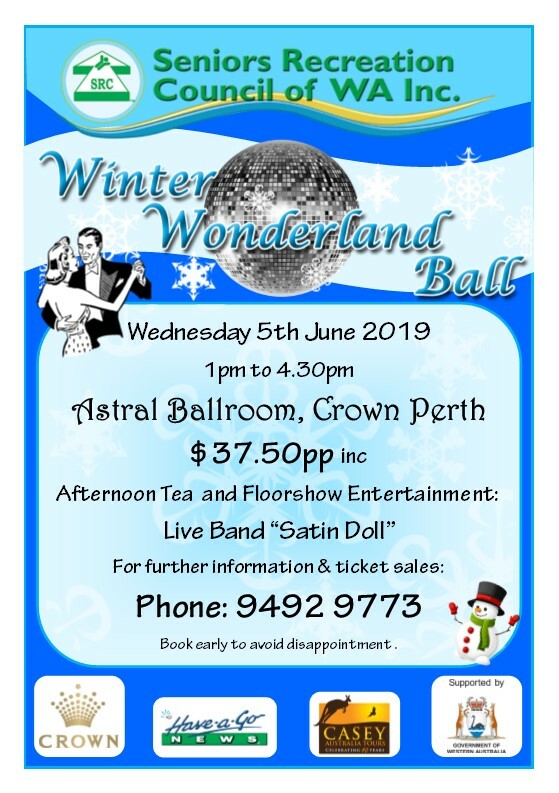 The Seniors “Winter Wonderland Ball” is on Wednesday 5th June 2019 from 1.00 pm to 4.30 pm at the Astral Ballroom, Crown Perth. Tickets are $37.50 per person, includes afternoon tea and floor show, the very popular band “Satin Doll” will be playing dance music. Tickets for this wonderful event are now on sale, and will sell out fast.